ON MARCH 25, 1981, four days after she stepped off an airplane at O'Hare Airport to take over duties as Chicago's new public school general superintendent, Dr. Ruth Love got her first real taste of life in the Windy City. As she was sworn into office in the school board's downtown chambers, several dozen middle-aged, steely eyed white women sat in the front row and glared at her with a mixture of anger and contempt. They were the so-called "Bogan broads," mothers from the city's Bogan High School District on the southwest side who had been battling to preserve their all-white public schools for 15 years. After the ceremony, their representatives stepped to the microphone one by one, screamed ultimatums and ranted on about the injustices visited on their innocent offspring by "forced integration." The volume of indignation was so loud that those gathered in the chambers could barely hear the shouting outside where police were trying to control a mob of placard-carrying Hispanic demonstrators determined to get inside to ask why their schools were not getting a fair share of the federal educational dollar. Ruth Love sat through the meeting looking composed and very much in charge as the television cameras scanned her face in vain for any sign of hesitancy or fear. She knew what she was getting into, and this was exactly where she wanted to be. Two years later, 47-year-old Ruth Love is still where she wants to be and still very much in charge. If anything has changed, it's the quality and quantity of public protest concerning public education. To be sure, there are still occasional demonstrations and flareups by dissatisfied citizens, but most seem to lack the fine edge of bitterness they used to have. With her native resourcefulness, her unflappable presence and her public relations know-how, Dr. Love has managed to defuse much of the hostility. This is not to say the chronic problems which beset the school system  erosion of the tax base, poor test scores, sagging teacher morale, disciplinary problems and, of course, pupil segregation  have all been solved. They are still there and some have actually worsened in those two years. Yet there is in Chicago a growing perception, shared by whites, blacks and Hispanics, that Ruth Love is a no-nonsense, shrewd educator who just might raise the school system out of the mire with a mighty, colossal heave. This striking black woman, many want to believe, will summon the slumbering talents and resources of the city as no one before her could, to the task of making education work. That this perception is widespread is no accident. Ever since she came, Love has labored to create a positive, upbeat image of herself and her administration, and image formation is an expensive enterprise. Since her appointment, the board of education's public relations budget has tripled, as have the number of press releases, board reports and media appearances by the superintendent. Early last year, in fact, the Office of Employee Relations was moved out of the second floor of the downtown central office to make room for the newly combined and ever expanding Office of Communications and Office of Information. Last fall, the board of education's annual report looked and read more like that of a Fortune 500 company than a hard pressed urban school system. Never was heard a discouraging word in the slick, Madison Avenue-type brochure replete with photos, graphs and charts all relentlessly pointing toward improvement and success. Love said it all on page one: "We must look to create an educational renaissance in the public schools, a rebirth of the schools as a source of hope for the low-income child, as a gateway for the newly arrived child, as a stimulus for the gifted child, as a source of education for each and every child." She knows better than most that success or failure is not always based on the way things are but on the way they appear to be. Back in late 1980, the bedraggled members of the Chicago Board of Education were having a hard time selling anyone with top credentials on the idea of taking over the nation's third largest school system (after New York City and Los Angeles). With 597 schools, 435,000 students, 40,000 employees and a $1.3 billion budget, the whole operation was an unwieldy monster. Running it was like steering a great ocean liner through a sea of icebergs. Indeed, the hull of the vessel had already been ripped in several places, and it remained afloat only through some desperate repair measures by the Illinois General Assembly. When it was discovered in 1979 that the schools were $700 million in debt, then Supt. Joseph Hannon was forced to resign, and the legislators bailed out the system. But they created as a safeguard a special financial authority for the public schools headed by a chief financial officer, who became a kind of co-superintendent for the entire system. Interim General Supt. Angeline Caruso struggled on for a while in lumbering fashion, but it was evident that the schools needed a more energetic, charismatic leader for the long haul. Several top candidates from outside Chicago who were sounded out by the board, turned the job down flatly after learning how tough it would be. If the innate problems were not enough to scare off leading educators, there was always the Rev. Jesse Jackson, the flamboyant president of Operation PUSH, who insisted the job belonged by rights to Dr. Manford Byrd, a black deputy superintendent in the Chicago system. As discussions with Dr. Ruth Love, then superintendent of the Oakland, Calif., school system, grew serious, a barrage of calls and letters from prominent blacks and some whites in Chicago hit her desk. They advised her to stay where she was, that the Chicago school system was beyond salvation, and that, in any event, she should not frustrate the plans of Jesse Jackson nor betray the ambitions of her black brother Byrd. A delegation of Chicago women even flew to Oakland to tell Love to stay out of their territory. The strategy backfired, however. Whatever hesitancy Love had about accepting the job evaporated in the deluge of advice and threats. As everyone has since learned, there is nothing Ruth Love likes better than a challenge. She negotiated the fine details of her contract, finally settling on a yearly salary of $120,000  making her the highest paid school official in the country  and a nice lineup of perks, including a chauffeur-driven car. If she is to face challenges, she insists on doing it first class. Ruth Love comes by her interest in education naturally. Her grandfather was a runaway slave who founded the first school for blacks in Lawton, Okla. Her father was a self-educated contractor and her mother attended a year of college. Love grew up in Bakersfield, Calif., obtaining a bachelor's degree in elementary education from San Jose State University in 1954 (when she was 20) and a master's degree in counseling in 1960. She earned a doctorate in human behavior in 1971 from U.S. International University in San Diego. Her 27-year move up the professional ladder has been steady and sure: elementary school teacher in Oakland; Fullbright teacher in England; counselor and instructor in the Oakland schools; chief of the Bureau of Compensatory Education for the California schools; director of the Right to Read effort for the U.S. Department of Health, Education and Welfare in Washington; and then in 1975 superintendent in Oakland. She knew the top post in Oakland was not going to be a pushover. Her predecessor, Marcus Foster, had been assassinated by poison darts fired by members of the Symbionese Liberation Army! It was in Oakland during those difficult days that she established a reputation as a competent administrator and public relations whiz. 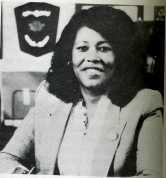 Innovations including her artist-scholar program brought big names like Alex Haley and Jane Fonda to the schools, and her Adopt-a-School concept involved local corporation personnel directly in the schools. When the Chicago offer became firm, Love  who is divorced and has no children  was ready to pull up her roots and head east with characteristic style and energy. Dr. Love sits behind the large desk in her second floor office at the board of education's central headquarters and smiles the reassuring smile of one who is in control. She is a large woman -not exceptionally tall or overweight  but large in the sense that she seems to dominate the scene just by being there. As always in public, she is fashionably attired: a blue ultrasuede suit and designer shoes. It's her hair, however, that is the most intriguing feature. There is a wild, disheveled quality about it, suggesting not so much carelessness as individuality. Although she conforms to the dictates of fashion, she does it her way. The office, like her hair, also has a wild quality, with books, folders, packages and plants lying around in no apparent order. On the wall behind her desk are 40 or 50 plaques which have been presented to her by schools, teacher organizations and community groups. Love's $40,000-a-year communications aide, Doris Payne, sits in the office during all interviews and records the conversation. It is a routine procedure, Payne explains, since Dr. Love frequently makes some insightful points in informal conversation which other staff members ought to hear about. In keeping with her upbeat approach, Dr. Love manages to mine gold out of almost every subject raised, stringing sentences together in a rich, melodious, self-assured voice. One has the impression she could continue indefinitely on almost any topic if she were not interrupted. • School Discipline: One of her first initiatives was the institution of a uniform, written discipline code for the entire school system, and, she says, "It has helped the staff and students tremendously because it delineates all the rules. If a student carries a weapon, he's not going to be punished in one school and get away with it in another. When there's a discipline problem, the one question we ask the teacher is, 'Did you follow the code?'" To cut down on gang activity in and around the schools, Love has "developed a better working relationship with the police," instituted a telephone hotline for reports on gang activities, and established in-school suspension rooms for serious disciplinary cases. In-school suspension not only keeps offenders off the streets but insures that the schools get their daily per pupil subsidy from the state. Before the Love era, the school system lost $24 million a year in state aid because of unexplained absences. In addition, she has asked truant officers to make night calls and has even recruited some private firms to volunteer their own employees to phone parents of truants. All of which is encouraging news, yet many veteran teachers privately complain that little has actually changed in the trenches and that discipline is, in fact, deteriorating in inner city schools, especially those which lost federally funded hall guards and monitors when the board's Comprehensive Employment and Training Act (CETA) money was slashed. • Achievement: Dr. Love waxes eloquent about the Chicago Mastery Learning Program, which she instituted in 1981 as a replacement for the much criticized Continuous Progress approach. Under Mastery Learning, now mandatory in all elementary schools, reading and math instruction is segmented into hundreds of separate skills, and students are given unlimited time to learn one segment before considering the next. "Students now have to perform," she says, "since they must be able to achieve 85 percent of the objectives in a grade before they are promoted. The system is extremely well structured and well accepted by teachers." The acceptance is not universal, however. An organization called Parent Equalizers has claimed that Chicago Mastery Learning not only fails to teach but uses degrading, racist reading materials. And the association of Chicago substitute teachers charges that the segmented philosophy behind Mastery Learning is faulty  a charge which was bolstered during a convention of national reading experts in Chicago last summer. But Love insists that the proof of the pudding is in the test scores, and she proudly recounts the latest reading scores reported amid much fanfare last July. "All 435 elementary schools showed improvement in reading," she says, "and some students jumped as much as two years. It's the first time in 10 years that there's been such a range of achievement." The reasons, she explains, are the extensive use of Mastery Learning by well-trained teachers and the new system-wide "plan of action" approach, which requires principals and teachers to coordinate their methods and expectations at the beginning of the school year. The Chicago media were mightily impressed by the July reading report, and one television station suggested editorially that Love's $120,000 salary should soon be raised. Generally ignored was the fact that the Chicago Board of Education has reported similar "significant" reading gains in six of the past eight years, yet the city's 8th graders today are still 1.3 years below the national average. Oddly enough, in 1974, Chicago 8th graders were only 1.2 years behind the nation  which makes any observer with a long memory somewhat cynical about reading scores. Nevertheless, Love thinks that the quality of this latest jump represents an "unprecedented achievement" and marks the start of a new era. • Integration: This is one area where Dr. Love appears to be trapped in a contradiction. According to the desegregation plan finally approved in January by U.S. District Judge Milton Shadur, 285 schools with black enrollments from 94 to 100 percent are considered "desegregated." And 19 all-Hispanic schools are similarly rated "desegregated." The two-pronged extent of the effort this year consists of some 32,000 students (about 7 percent of the school system's enrollment) who are attending schools outside their district for educational and integration purposes, and a special Options for Knowledge upgrading program in 45 of the racially isolated schools. "If a real integration program had been developed 25 years ago," says Love, "we would have integration now. We are doing the best with what we have." What Love has inherited is a school system that is 60 percent black, 20 percent Hispanic, 16 percent white and 4 percent "other." These are hardly ideal proportions for racial mixing; it is simply too late for significant integration unless suburban school districts are to be involved (which the judge is not requiring). But Love feels compelled by her position to endorse the Chicago plan as it is. She praises its "voluntary character and potential." She does not go as far as William Bradford Reynolds, assistant U.S. attorney general for civil rights with the Justice Department, who called Chicago's minimal token integration plan "a model for the nation." Love becomes almost upset when pressed on the Options for Knowledge component, which will provide supplementary educational courses and programs in some all-black or all-Hispanic schools. Whatever its value, Options for Knowledge is not integration. Yes it is, insists Love, since the special programs will raise the achievement levels of the minority students and help them ". . .to compete in an integrated society" when they get out of school. "Integration is important," she notes moments later, adding, "Children cannot learn in schools that are racially isolated." That is precisely the point raised by critics of Judge Shadur's order, yet Love seems to argue that the all-minority schools are not really racially isolated as long as they have programs preparing the students for life in an integrated society later on! • Board of Education Bureaucracy: For generations, a handy whipping boy for public education's foibles has been the entrenched, multi-layered bureaucracy for career administrators, educational experts and tired former principals in the board's huge central office. The public may have had a perception that the central office is too fat, concedes Love, but it is a false perception  at least under her administration. She speaks of "new instruments" to evaluate all personnel objectively and insists the central office is not a refuge for incompetents and burnt-out cases. "I don't believe you improve your product by having ill-trained or incompetent people in key positions," she says. "Our product is educated students. We have to use the same businesslike methods as any major corporation." She notes that the biggest proportion of the $150 million cut from the budget two years ago was at the central office. But there is some evidence that Love has actually added yet another layer at the top of the bureaucratic pyramid, comprised largely of black administrators who share her positive mental attitude: the $55,000-a-year deputy superintendent for field management, for example; or the $48,000-a-year director of the High School Renaissance program. Board records show that there are now 54 persons on the staff earning more than $50,000 a year and another 200 making between $40,000 and $50,000. Four years ago  before the severe budget cuts  only two persons in the system had salaries exceeding $50,000. • Adopt-a-School: Praise and publicity has been lavished on Dr. Love, thanks to this innovation which she pioneered in Oakland. Thus far, some 100 businesses, corporations, hospitals, colleges and other institutions have adopted individual inner-city schools; that's about 20 percent of the city's schools. Their contributions include computers and other mechanical equipment, tutors, resource persons, contest sponsorship and a range of other free services. Adopt-a-School works well because Love sells it with missionary zeal during her frequent luncheon dates with corporate executives. "The private sector is more open to partnership with the schools," she says, "since they're beginning to realize that if the school system is no good, then the city is no good!" children and the $13 million in CETA cutbacks, which eliminated school aide and monitor jobs. And Reagan's proposal of tuition tax credits for private schools strikes her as adding insult to injury: "It's a mistake to pit public versus private education. The administration doesn't seem to understand who educates 90 percent of the children in this country." To counter student losses, Love began this year a new campaign to attract transferees from Chicago private schools. "If they can recruit from us," she says, "we can recruit from them." So far Love is only talking about this plan. This year the board's overall budget of about $1.3 billion is about the same as last year's, but given inflation and new expenses, this represents a net loss. As the belt continues to tighten, Love says the board may have to cease responsibility for auxiliary services like immunization, teenage pregnancy and lunch programs. "Other agencies are going to have to get involved," she declares. "There's a limit to what the schools can do. . . .Nevertheless, I'm convinced it's possible to improve education even in these constrained times." Although Love and her staff formulate the yearly budget, the separate school financial authority oversees all financial matters. Love regards this bifurcated system as "a managerial nightmare" and has had several run-ins with its $100,000-a-year chief financial officer, Joseph Mahran. * "This is an inefficient way to run things," she says. "I don't know any corporate executive who would accept it." • City Politics: Three weeks after becoming superintendent, Love was involved in an uncharacteristic publicity gaffe which almost aborted her new career. She claimed before the television cameras that her car and offices had been bugged, thus triggering immediate suspicion of a city hall plot to discredit her. Five days later, a mortified Dr. Love acknowledged that the bug was a hoax; her chief deputy, a trusted associate who had accompanied her from Oakland, had actually fabricated the story in a lame-brained scheme to make her more security conscious. The deputy was promptly exiled, and relations between Love and Mayor Jane Byrne have remained frosty though polite. "I run the schools," she says now, "and the mayor doesn't tell me what to do or whom to hire. The school system is not a patronage office." To say that Ruth Love has survived her first two years in Chicago would be an understatement. To a large extent she has thrived. In her depths, there must be a molten core of self-confidence which enables her to soar when panic seems a more appropriate reaction. She has strong managerial skills, she acknowledges, and has "no trouble making decisions." She adds, "I work well under pressure, usually because I've researched the issue thoroughly ahead of time." The institutional racism which is still an integral part of big city life has not impeded her in Chicago, says Love, ". . .because I won't tolerate it. I use the power of my office not to let it happen to me. . . . But of course I'm unique. I'm a black woman in a position where I can demand respect." *Mahran's contract may not be renewed. Robert J. McClory is author of The Man Who Beat Clout City, contributor to Chicago magazine, Chicago Reader, The National Catholic Reporter and former city editor of the Chicago Daily Defender.